Arjun Kapoor who will next be seen in the multi-starrer period drama, Panipat: The Great Betrayal recently posted an adorable picture from his childhood on his Instagram. The actor has been under rigorous physical training to look fit for the role of Peshwa Sadashiv Rao Bhau. While his intense workout pictures give us major goals, Arjun’s childhood pictures make him look like a bowl of mush! He took to his Instagram to share an adorably angry picture of him sitting with his hands under his chin. His long time girlfriends, Malaika Arora, just couldn’t stop gushing over his picture! Arjun even joked about it being his first look from the upcoming magnum opus, Panipat: The Great Betrayal. 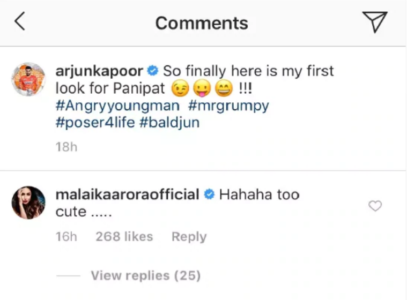 Take a look at the picture and Malaika’s comment. Panipat also stars Kriti Sanon, Sanjay Dutt, and Rekha among the others and will hit the box office on 6th December. All things aside, how adorable are Arjun and Malaika though!